As a social studies teacher for 15 years I reflect back to many frustrating hours spent grading and correcting student work that I felt was sub par compared to my standards. Heading into each new unit with high hopes of a different outcome where my students might just knock this assignment out of the park I would provide rubrics and checklists and sometimes even show them examples of great work. At times I would receive a select few pieces of work that showed the ability that I knew my students possessed but for the most part that was not the case. While I may have been asking students to do great work I wasn’t providing a structure that taught and assessed craftsmanship and artistry. In the current environment of high stakes testing and accountability it is difficult not to get caught up in the stressful race of “covering the content” but slowing down and designing instruction in a way that engages students and creates a culture of reflection and revision can yield results that will show up on tests and beyond. In 2003 Ron Berger published An Ethic of Excellence: Building a Culture of Craftsmanship with Students where he outlined this paradigm shift for schools. This two part video is a great example of his work on peer critique using student work in a presentation to a group of educators. Because we know that many students (and teachers) often struggle to give and receive good feedback using his guidelines of “Be kind, be specific, and be helpful” are helpful starters. 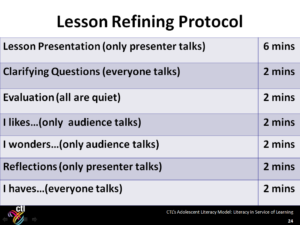 In addition, using a framework like Critical Friends Protocol with sentence starters for warm and cool feedback to structure the discussion can help turn wandering conversations into meaningful reflection and revision. With the understanding that many teachers enter into PLC, staff or department meetings with two questions in mind, “how long will this take?” and “what do we need to turn in?”, wouldn’t it be great if we looked forward to those times together and viewed them as true opportunities to refine our craft and and enhance our artistry? Moving a staff and students toward this culture of craftsmanship and artistry does not happen overnight. As with any paradigm shift it is a process of movement along a spectrum where all parties involved play their part. A highly evolved class or school where students not only feel comfortable but are good at peer critique takes work. Having seen and worked with professionals who regularly engage in peer critique it’s important to note that the true establishment of a cultural shift must include teachers, not just students. While the use of protocols and critique might feel awkward and relatively unproductive at first, as the comfort level and skill improve the practice can yield fantastic results where student and teacher work becomes inspiring and profound. This entry was posted in Blog and tagged critical friends protocol, Instruction, lesson refining protocol, ron berger, rubrics. Bookmark the permalink.